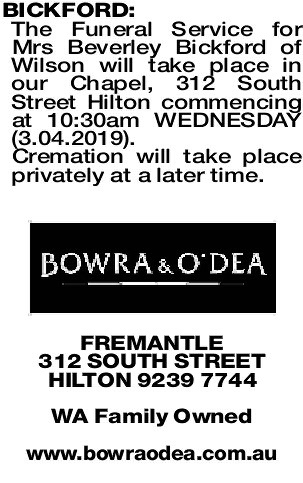 The Funeral Service for Mrs Beverley Bickford of Wilson will take place in our Chapel, 312 South Street Hilton commencing at 10:30am WEDNESDAY (3.04.2019). 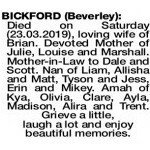 Died on Saturday (23.03.2019), loving wife of Brian. Devoted Mother of Julie, Louise and Marshall. Mother-in-Law to Dale and Scott. Nan of Liam, Allisha and Matt, Tyson and Jess, Erin and Mikey. Amah of Kya, Olivia, Clare, Ayla, Madison, Alira and Trent. Grieve a little, laugh a lot and enjoy beautiful memories. 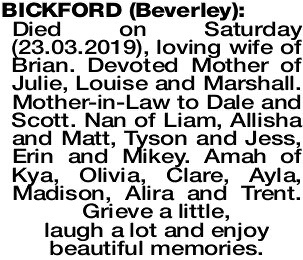 Deepest sympathy to Brian, Julie, Louise, Marshall and families. When thoughts go back as they often do, we treasure the memories we have of a dear friend. Rest in Peace. From Aloma and family. 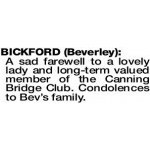 A sad farewell to a lovely lady and long-term valued member of the Canning Bridge Club. 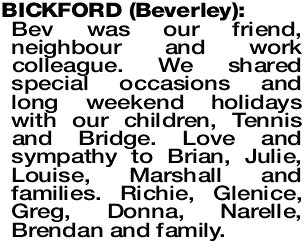 Condolences to Bev's family. 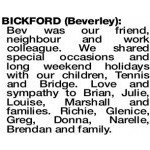 Bev was our friend, neighbour and work colleague. We shared special occasions and long weekend holidays with our children, Tennis and Bridge. 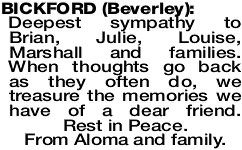 Love and sympathy to Brian, Julie, Louise, Marshall and families. Richie, Glenice, Greg, Donna, Narelle, Brendan and family.